Please Vote for Sam's Video in the Culturelle Tummy Truths Contest! Please Vote for My Son Sam! Sam, our 7 year old son made a video for Culturelle’s Probiotic Tummy Truths Contest on Facebook in hopes to win a trip to Walt Disney World for our entire family! Low and behold, he made the finalists and now needs your votes to help him win! 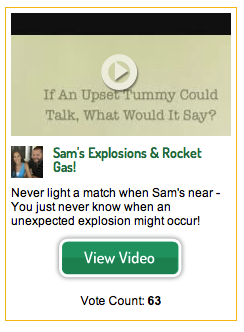 Yes, his video is about gas & explosions… LOL! But that was kinda the whole point of this contest. Culturelle is the makers of Probiotics (good bacteria), and they wanted kids honesty about their Tummy Troubles. The voting is all done through Facebook and you can vote once per day until September 11, 2012… here’s the Facebook Link (or if that one doesn’t work, you can click here too). If you’ve voted, please leave a comment… Sammy & I would love to hear from you!